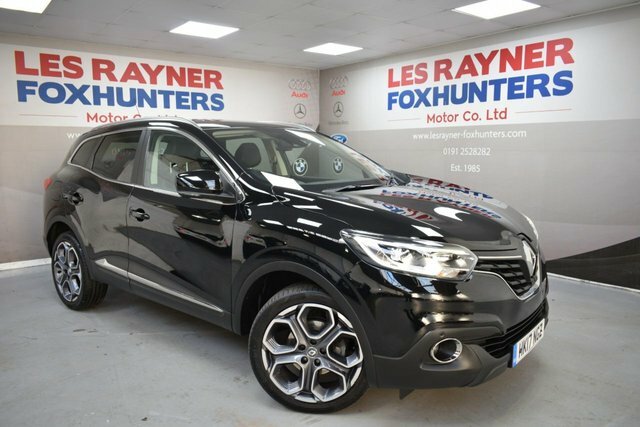 HK17NGZ RENAULT KADJAR 1.6 DYNAMIQUE S NAV DCI 5d 130 BHP- 22K miles- 2 owners from new The Kadjar dynamique offers a fantastic specification of 19" alloy wheels, front and rear park sensors, privacy glass, half leather interior, electric fold mirrors, autolights, autowipers, dual zone digital climate, cruise control, speed limiter, lane departure warning, Sat nav, traffic updates, bluetooth, FM/DAB radio, usb/aux connectivity, electric windows and remote central locking. Fantastic value for money!! Best value for money car currently for sale in the UK ! 6 months	£77.00 12 months	£140.00 MPG Extra	68.9 MPG Combined	62.8 MPG Urban	55.4 TO VIEW ALL OUR STOCK VISIT www.lesrayner-foxhunters.co.uk We are a family run business that has been established since 1982.All of our cars are HPI clear and come with a 12 month MOT, Full Service and Pre Delivery Inspection so you can buy with confidence. Personalised Videos and Facetime available! LOW RATE FINANCE! BESPOKE HIRE PURCHASE, PCP & LEASE PURCHASE PACKAGES! PART EX WELCOME! NO SALES ADMIN FEE!